Next up was Save The Date. In an effort to make up for my darker than expected pick with Filth, I (wisely) deferred to the Missus for Round 2 and after some browsing on Netflix she came up with Save The Date. It looked good, so we watched it. Sarah and Beth are sisters who are in relationships with Andrew and Kevin who are both in the same bend. Beth is engaged to Andrew and making plans for their wedding, while Sarah, an artist who manages a bookstore, reluctantly moves in with Kevin despite her ambivalence about taking their relationship to the next level. Kevin, for his part, is planning to propose and initially plans to do it onstage at their next show before Andrew thinks he talks him out of it. Well, guess what? When the performance in question rolls around- Sarah is approached by Jonathan, who has a crush on her and hangs around her bookstore- but he backs off when she reveals that she's living with Kevin, who is her boyfriend. Kevin, who has had a few beers (always a good idea before proposing) and is having a really awesome show decides to go ahead and propose before their band heads out on tour, despite Andrew attempting to wave him off. (Andrew had let the fact that Kevin had a ring ready to go slip to Beth, who tells Andrew to talk Kevin out of it because Sarah, her sister, will freak out if Kevin proposes.) And guess what? Sarah totally freaks out when Kevin proposes. She moves out. They break up. Beth, in the meantime gets all wedding crazy and obsessive, which causes friction with both her fiance Andrew and sister Sarah. Sarah, for her part has started a new relationship with Jonathan, the dude who the crush on her who hangs around her bookstore. One thing leads to another and Sarah soon finds out that she's pregnant! She pulls away from everyone, including Jonathan, freaking out and trying to figure out what to do- but eventually has to tell Beth, who, in the midst of being wedding crazy takes it as an attempt to ruin her wedding. Sarah first solo show of her artwork gets everything boiling over. Beth doesn't show up, which makes Andrew mad at her. Kevin shows up at Sarah's apartment and wants to date her again, but she tells him she's pregnant and it isn't is. Kevin then goes and beats up Jonathan at the aquarium the next day. 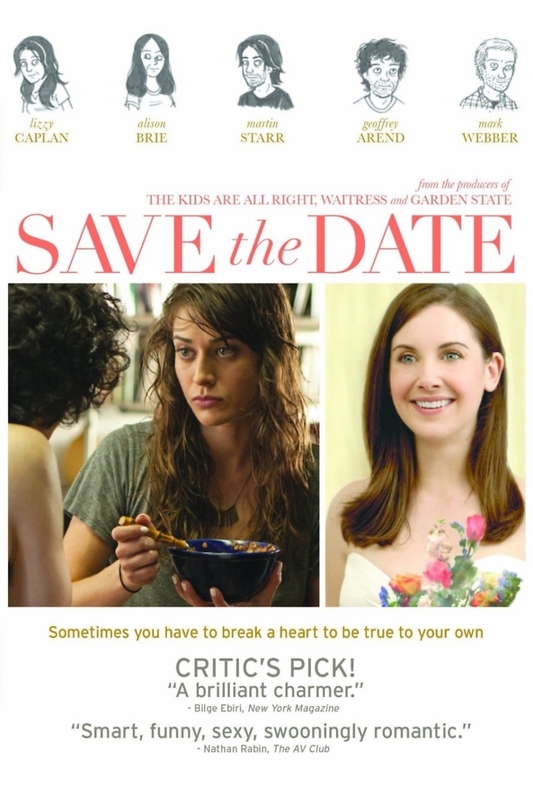 Andrew and Beth meet at the synagogue and agree to postpone their wedding. Sarah almost gets an abortion but decides not to and then goes home to find Jonathan waiting for her and she kisses him, sits him down and says, "Jonathan-" and then we never get to find out what the hell she tells him because that's when the movie ends! There are a few movies that sort of fall into this 'indie-rom-com, vaguely sepia toned.' I don't know if I'd call them an oeuvre or a category, but they are kind of look and feel the same. Movies like Drinking Buddies, The Overnight- maybe even In A World, though that has less of the rom-com thing going on- but Save The Date would fit right in with them. This was a good movie. It wasn't the greatest movie I've ever seen and it felt curiously underdone in parts. (Timothy Busfield was also in this movie for like a second. Which seems like a waste of Timothy Busfield.) The Netflix summary also makes much of the fact that Sarah is the manager of a bookstore, but it's the fact that she's an artist that seems to be more important in the actual movie itself.